Some people head to London to try to get a glimpse of the Queen (or maybe Meghan Markle and Prince Harry since, you know, #couplegoals). I, on the other hand, go for the fooooood. 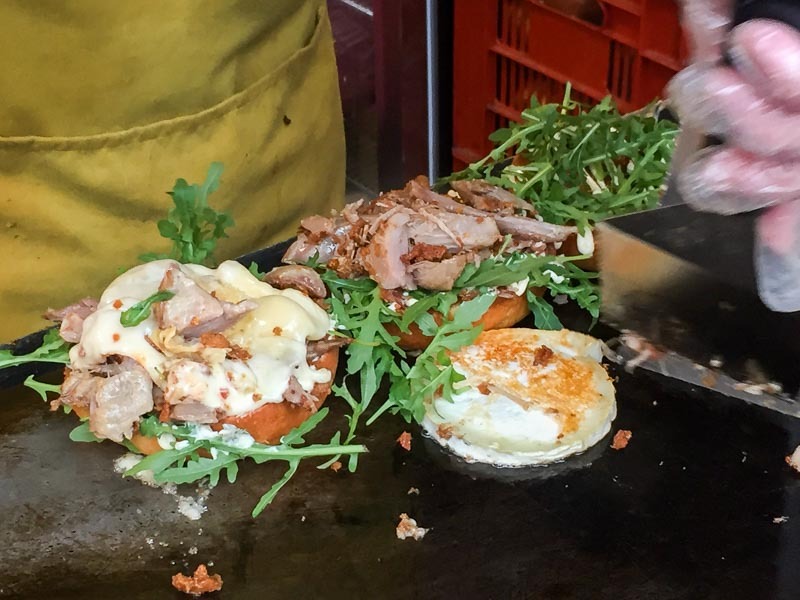 The pound versus Singapore dollar situation still isn’t that ideal, so you’ll get more bang for your buck by seeking out affordable street eats. 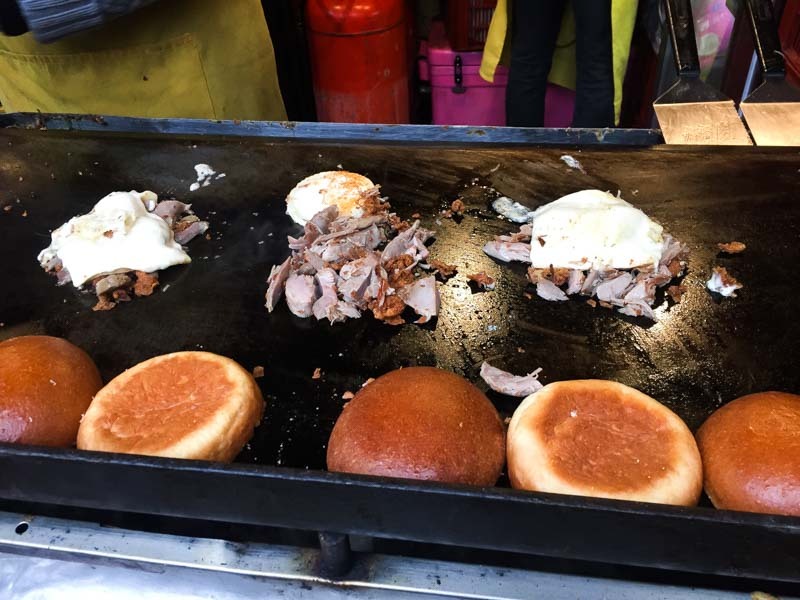 One of my absolute go-to favourites is The Frenchie, where you’ll find probably the best duck confit burger in London. 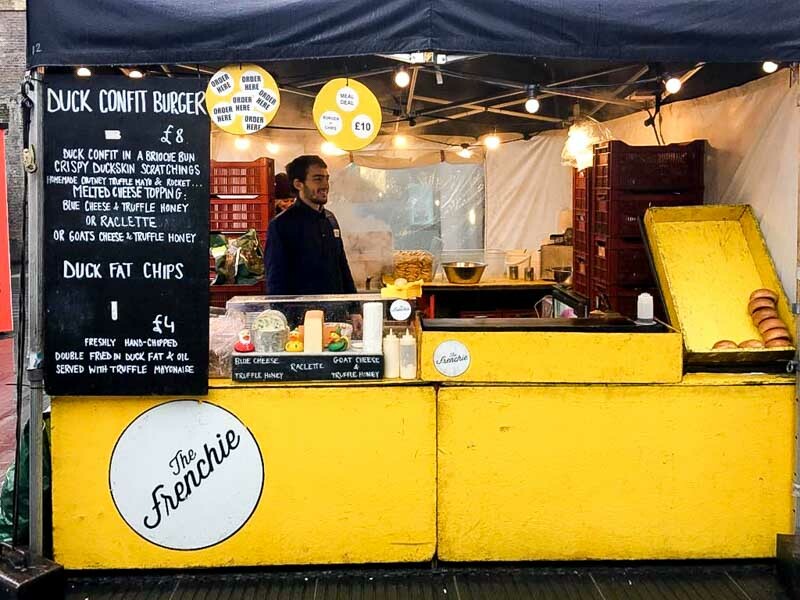 You can find the stall at various spots around the city, but it’s kind of a mobile company so I prefer to head to the one set up at Southbank Centre Food Market (nearest tube station: Waterloo) which has been there for awhile. The market is outdoors and you’ll easily spot it if you’re walking from Waterloo tube station. When you’re there, just look out for the bright yellow stall or follow the smell of fried duck fat. Do note that they only open on weekends here (Fridays to Sundays and Bank Holiday Mondays), so plan your visit wisely! 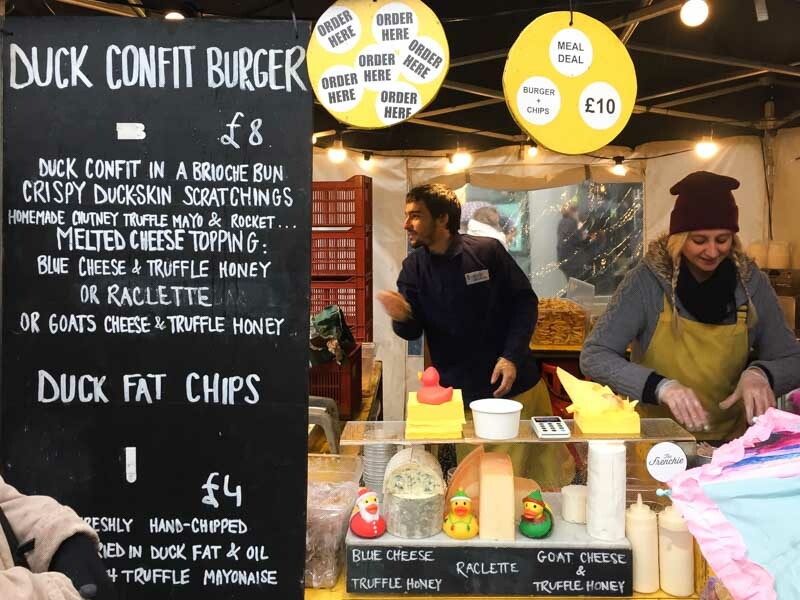 The stall only offers two items on the menu, and boy, do they do them well – Duck Confit Burgers (£8) and Duck Fat Chips (£4). I always go for both because… yum. Plus, there’s a meal deal, so you can get both for just £10 and save some cash. 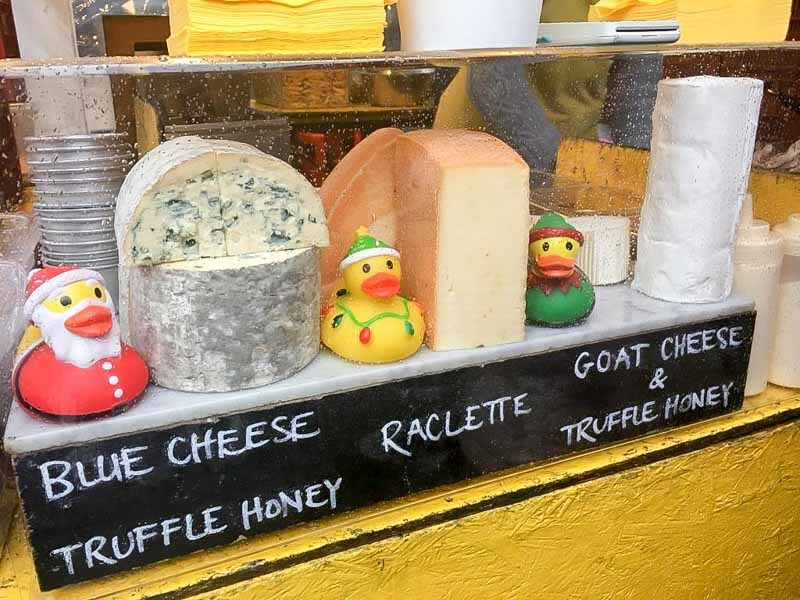 Start by choosing which cheese you’d like with your burger: Blue Cheese and Truffle Honey, Raclette or Goat Cheese and Truffle Honey. The Raclette is probably the mildest of all the options, and I got that since I didn’t want anything to overpower the duck. Burgers are cooked to order, so be prepared to wait a little bit. 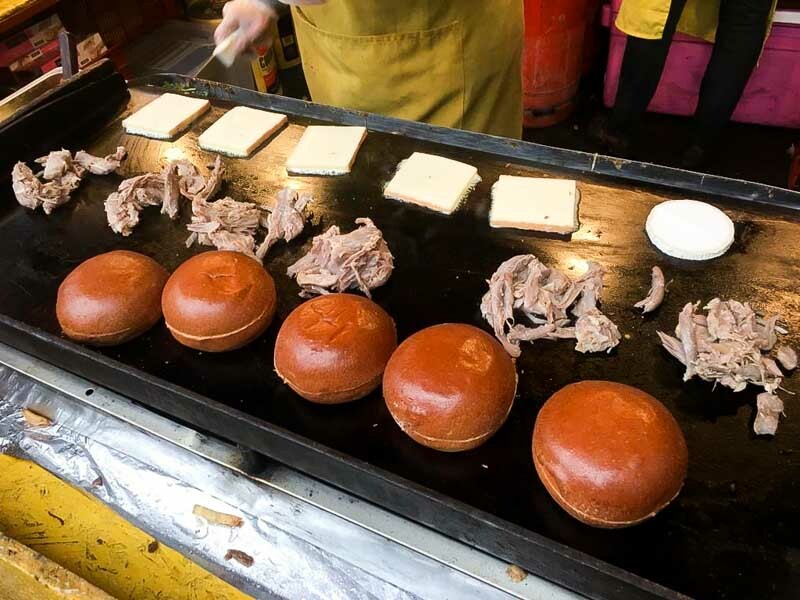 Pieces of duck confit, sliced cheese and brioche buns were laid out to be warmed up, and the sight of the assembly line drew even more hungry customers as I waited patiently. Duck confit is actually a French dish, and the term ‘confit’ refers to the process of preserving the meat by salt-curing it before cooking it in its own fat. In other words, absolute deliciousness. Each burger at The Frenchie includes a good portion of duck confit that’s warmed up with pre-fried crispy duck skin scratchings. 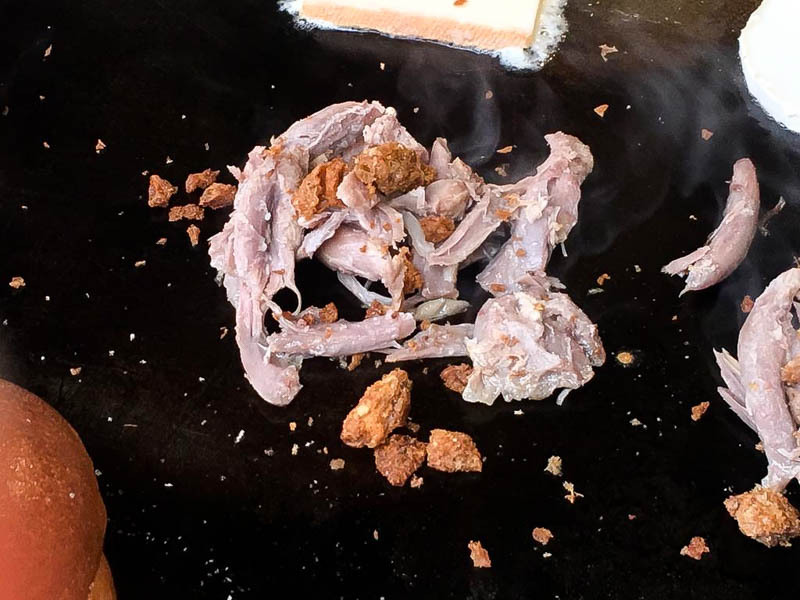 Familiar with deep-fried chicken skin (and how sinful it is)? This is basically the same thing. After the sliced cheese had melted and the brioche buns were warm and toasty, everything was layered together. 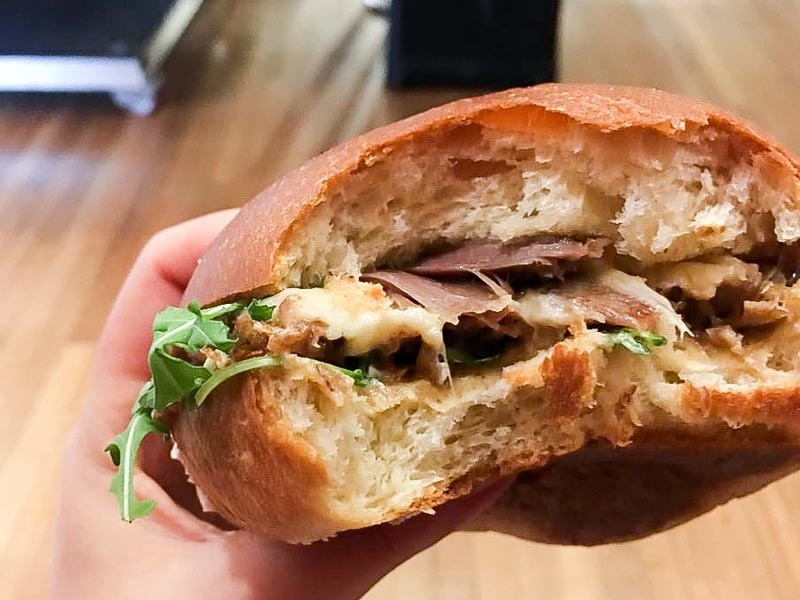 Homemade chutney, truffle mayonnaise and fresh rocket leaves were then added to the mix for even greater depths of flavour. The result? One inviting-looking burger that will change your life (I’m not even exaggerating). Before you sink your teeth into this divine creation, make sure you collect your fries. 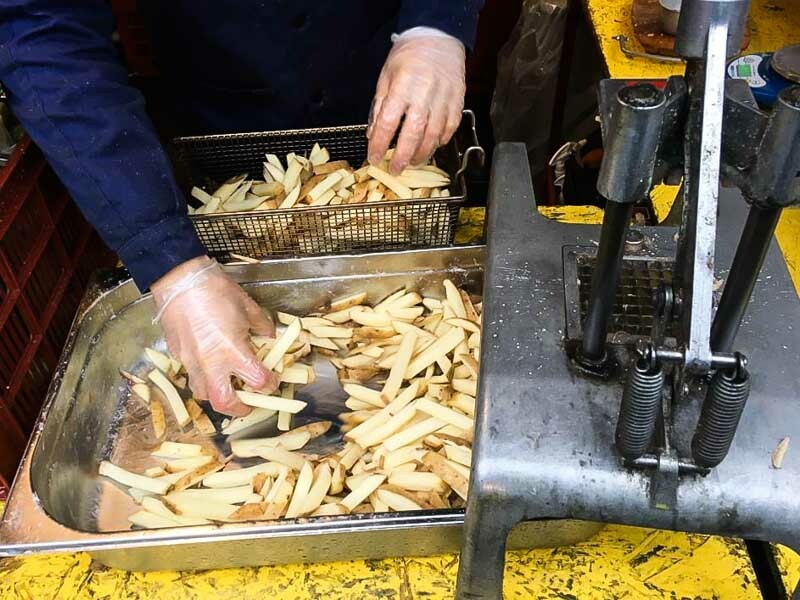 The fries (or rather, chips) are freshly hand-chopped at The Frenchie before being double-fried in duck fat and oil. My arteries are clogging up as I type this, but you’re on holiday and trust me, this is worth it. 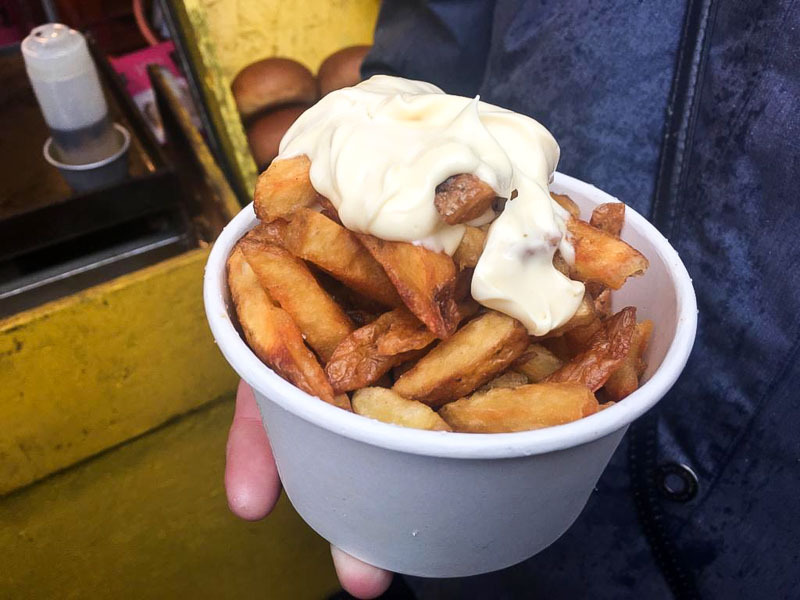 The fries are served with a healthy (lol) dollop of truffle mayonnaise which made them 10 times better. It was pretty cold when I was there, so I made sure to dig in while they were still hot. Crispy on the outside, yet soft and pillowy in the middle, these chips are my idea of a cheat day. The hint of truffle really complemented the use of the duck fat and gave these chips that little bit of extra oomph. 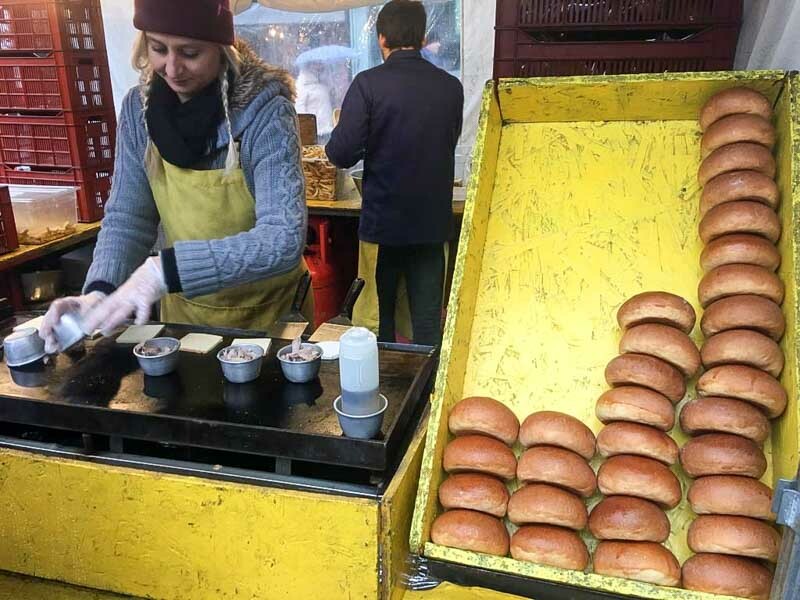 There are some seats in the outdoor market, but it was freezing and I wanted to enjoy my burger, so take note that you can pop into Southbank Centre right next door and find a free spot to stay warm and eat. A couple of bites in, and I remembered why I always keep coming back. The brioche bun made all the difference and added a butteriness to the overall burger. 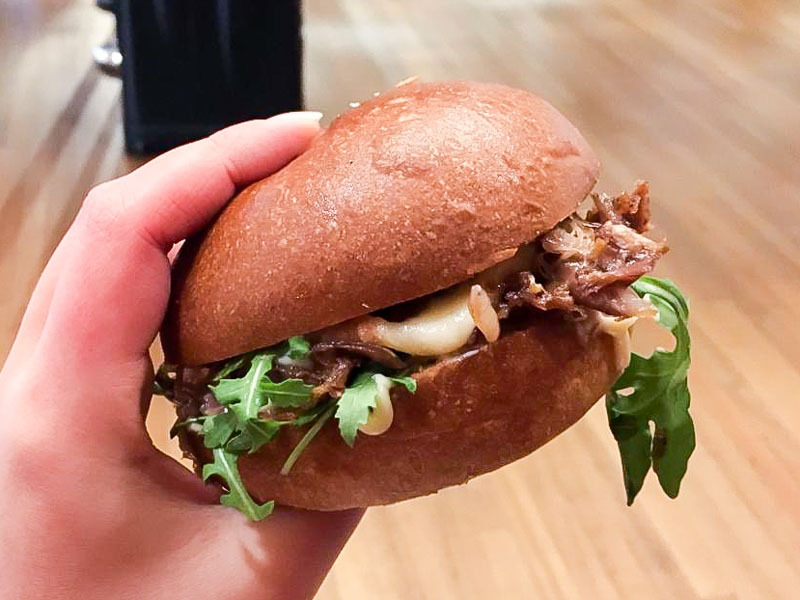 The pieces of duck confit gave each bite just the right amount of saltiness and paired well with the sweetness from the homemade chutney. Burgers should ALWAYS come with cheese and the melted raclette was super creamy and worked really well with the slight peppery notes from the rocket leaves and that little hint of truffle in the mayonnaise. I’m telling you, this burger is spoiling the market! You won’t be short of places to eat when you visit London, but this is one place that’s still pretty unknown to Singaporeans. 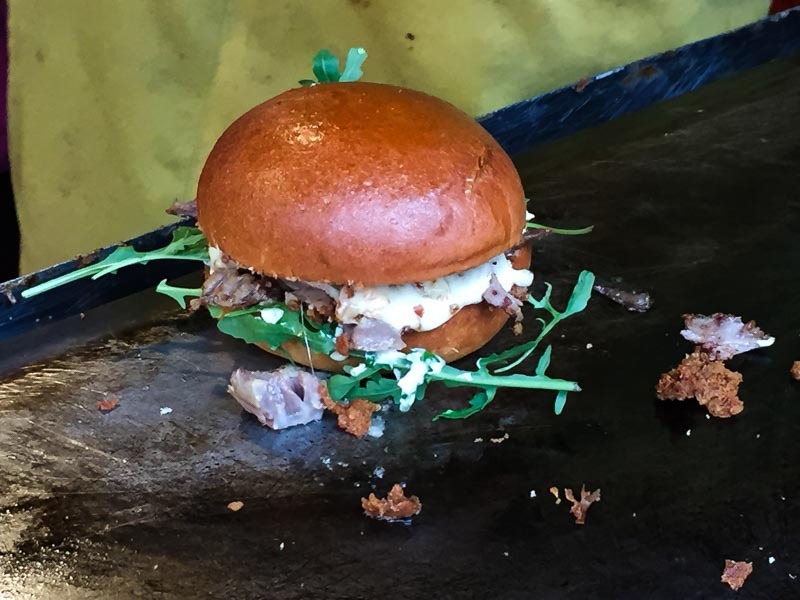 Ready for the best duck confit burger in the capital? Head to Southbank and thank me later.